Ever consider that a website audit could be the only thing standing between what you know your website could be and what it currently is? With all a website’s moving parts (how often do you update your website?) and their sheer size (how big is your website? ), websites can quickly fall into disrepair and lose their usability, measurability, findability and privacy. A periodic website audit can help prevent that. Here are three reasons why you should do a website audit today. Ever spent time on a broken site? Probably not for long. Missing pages and broken features are a quick turnoff for visitors, making them feel like they’re better off checking out your competitor’s website instead. You rely on the analytics and digital marketing tools installed on your site to measure website activity and enhance the user experience. These technologies (installed in the form of website tags) make visits to your site more meaningful and measurable. Use your browser’s dev tools to scan through each page’s code and network requests to see if 1) each tag is present and 2) it’s sending out the right data in the network request. This is a highly manual process and subject to human error, but is usually where website stakeholders start. Use a tag auditing tool to perform a regular, bulk scan of your website to discover tagging errors. Automated tag auditing is much more sustainable than manually discovering tagging errors, and they can also test for issues with SEO or website functionality. The GDPR scare has waned somewhat, but the drive to protect consumer data (whether fueled by a desire to comply with regulation or out of a respect for customer privacy) should grow in strength. As part of your website audit, you should determine if at any point you’re collecting sensitive customer information without permission or in a way that could compromise the privacy of that data. As in the previous step, you’ll need to scan network requests to check whether or not they contain any personally identifiable information (PII). If you’re collecting PII like names, phone numbers or zip codes in your analytics tool, stop now, because you’re almost certainly breaking your analytics vendor’s terms of service and are putting consumer data at risk. Another thing to consider is that you may have tags on your site that you’re wholly unaware of. If you employ an agency, they may have deployed tags of their own on your site, and these tags could have in turn deployed their own tags (known as “tag piggybacking”). Finding these unknown rogue tags and checking for PII can be more challenging than with known tags, but you’re just as responsible for them as you are for any other tag. Under these circumstances, automation is your best friend. When a tag auditing tool scans network requests, it can tell you every tag that’s on your site (including piggybacking tags) as well as identify if there’s any PII through pattern-matching. That way you can ensure data privacy at scale, without picking through network requests all day long. Automating your website audit using a tag auditing tool can drastically increase the efficiency and accuracy of your audit results. If you have a large website that changes often, then an enterprise-grade tag auditing tool is your best bet for success. 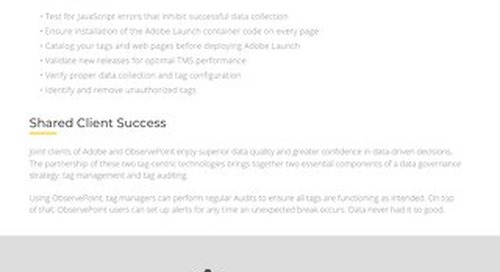 See what you can learn from a sample audit of your site.